Landscaping can be a challenge when you are on a tight budget. 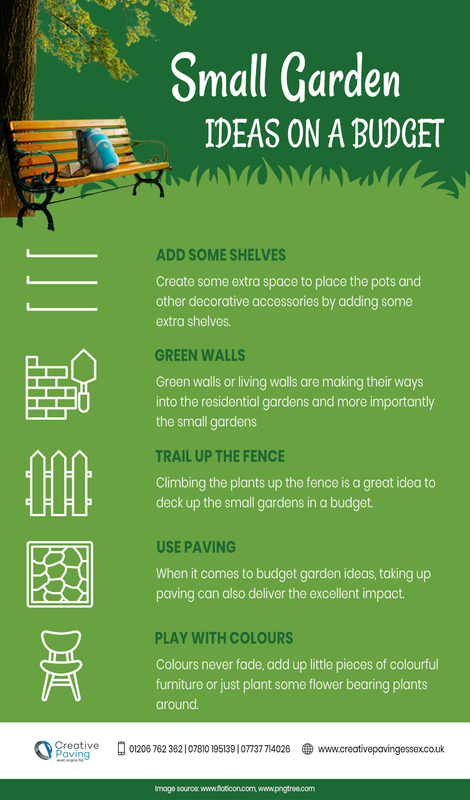 But it can be made easy when you follow simple advice for small garden ideas on a budget. Small gardens have their own advantages, the most important one is they are low maintenance structures. There could be number inspirations you can get from the internet, but it becomes difficult when you have to do it without spending your fortune. The most modest gardens have the outdoor greenhouse to grow plants. Simple garden ideas like you can simply add trough under the kitchen window and use up that space. Small gardens shout out for space, so it a great idea to allow the low walls to raise and make a seating arrangement for guests and friends in the garden area. Also paving the garden can help garden get that elegant and luxurious look. If you are looking for paving Essex, Creative Paving East Anglia Ltd has you covered. We also provide resin bound stone, garden, patio, imprinted concrete driveways along with resin driveways Essex. If you wish to know more about driveway installation and repairs, contact us today and request for your free quote. As a family business, we believe in the importance of providing an honest and expert service at an affordable price. Our dedication to our customers ensures that their satisfaction is always achieved.